SIMPLICITY 1691168 Sunstar, 1693109 Legacy, 1694171 Prestige, 1334 Pacer Series W 34In Deck, 1692302 Landlord, 1692054 512G, 1692056 512H, 1692900 Zt, 7800379 Axion, 1692557 2413H, 1692457 1920H, 1691889 1613H, 1691894 1613G, 1692081 1616H, 1692406 Regent, 1691954 Gth 20Hp, 1691958 Gth-L 17Hp, 1692024 Gtg, And Many More. Perfect fit. I am please with the end results of all the products Would not hesitate in ordering parts from you again. The exact item I needed was shipped intact and fits perfect. 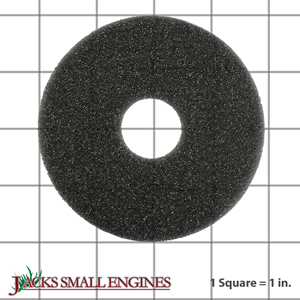 Ask us about the Simplicity 1707335SM Poly Foam Gasket. Please no repair questions. Your Q&A may be posted to Jackssmallengines.com to help other shoppers, like you, with their purchasing decisions. Thank you.